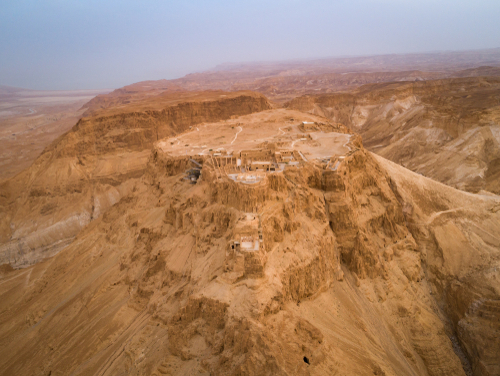 The battle for Masada was necessary politically. 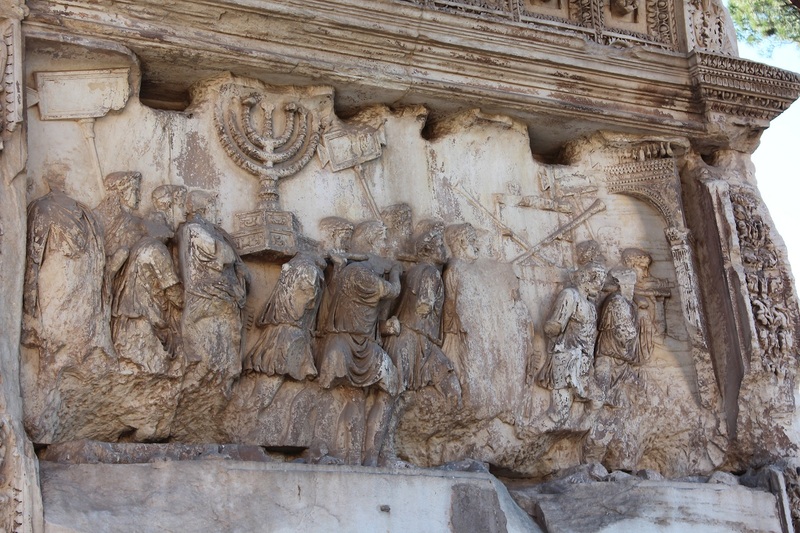 The Judaean War was already declared to be a victory with the destruction of the Temple and conquest of Jerusalem in 70AD. 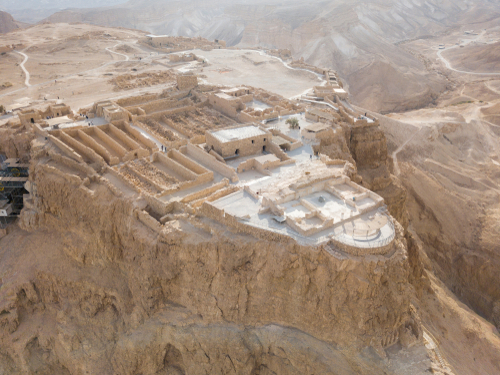 Masada fell three years later in 73AD. The Roman governor of Judaea, Lucius Flavius Silva, headed the Roman legion X Fretensis and laid siege to Masada. The Tenth Legion was created by Octavian in 41/40BC and was created during the Civil War at that point in time. The Tenth Legion was very distinguished for it was named after the Tenth Legion formed by Julius Caesar and its symbol was that of a bull which was the holy animal of the goddess Venus, which was supposed to be the goddess of the Julian clan. The Tenth Legion fought against Sextus Pompey but later it also fought with Octavian against Marc Antony and Cleopatra. You will find Vespasian coins in all metals announcing the victory over Judaea in 70AD. There were no coins to proudly announce the victory over Masada three years later. The only coins you can attribute to the siege of Masada are bronze coins of the former Emperor Nero (54-68AD) counter-stamped with “X” which was Legion X that was stationed in Judaea during the conquest. These two coins counter-stamped “X” are quite rare. They obviously cannot be prior to Nero and the coins were not new when counter-stamped. Some have argued that those stamped on the coins of Nero are from the Legio X Equestris (Equestrian) otherwise later known as Gemina, which was originally formed before 58 BC–45 BC and was Julius Caesar’s personal legion. It became more of a normal legion rather than calvary so it became more commonly known as Legion X Germina. Roman counter-stamps of numeral “X” with a bar across the top or bottom are attributed generally to Legion X Gemina, stationed in Pannonia. They too are typically found on the coins of Nero from the mint of Lugdunum, but only after Nero’s death. The Legion took no active part in the Civil War of 68-69AD. In July 68AD, they were reassigned to the province of Spain by Emperor Galba and took no active part in the struggles for power which followed. The counter-stamp is believed to have been used sometime within the year 68/69 AD. Legion X Fretensis and V Macedonica were sent to Alexandria, Egypt in 66AD in preparation for an invasion of Ethiopia planned by Nero. However, both of these legions were diverted to Judaea to suppress a revolt that was beginning on a large scale. Following the death of Nero in 68AD, another civil war broke out. Vespasian was then compelled to go to Rome the following year where he seized power. There were five major contenders for the throne following the death of Nero – Gaius Julius Vindex, Clodius Macer, Galba, Otho, and Vitellius. The legions in Alexandria and in Germany declared loyalty to Vespasian and thus he easily defeated Vitellius. Vespasian’s son, Titus finished the suppression of the revolt in Judaea. 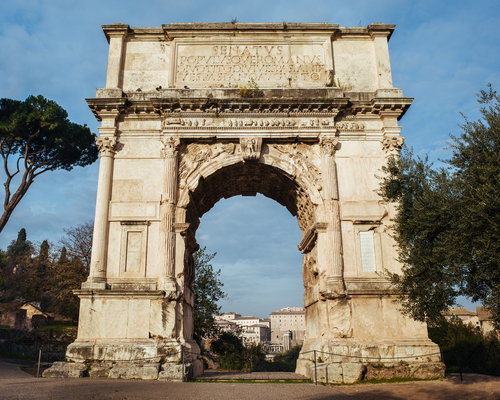 The Arch of Titus which stands in the Roman Forum commemorates the conquest of Jerusalem as they carry off the loot from the Temple. Legion X Fretensis remained in Judaea and completed the siege of Masada. Therefore, these coins counter-stamped “X” must be post-66AD and that places them in Judaea. Of course, there are those who argue that even without the bar they are most likely from Legion X Gemina. The general argument is that Legion X Fretensis did use just the “X”, however, the more common countermark is that of “XF” or “LXF”. While this may be true and they are found typically on local colonial issues, the existence of these countermarks extends well beyond the people of Masada. For example, here is a coin on Vespasian’s second son, Domitian. The coun is dated locally to 81/82AD. Therefore, the “LXF” countermark is applied almost a decade after Masada. 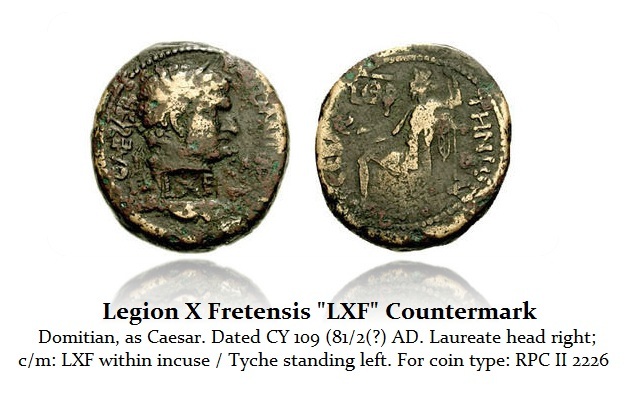 Consequently, the only coins that we can attribute to the possible siege of Masada are those of Nero counter-stamped “X” for Legion X Fretensis. Countermarks are also found upon the local coinage of Judaea & Samaria must be pre-73AD if not 70AD. The vast majority of surviving countermarks are probably post-Masada.